Lots of things hang from lamp posts. Posters, banners, plants, lights, raccoons...wait, raccoons? 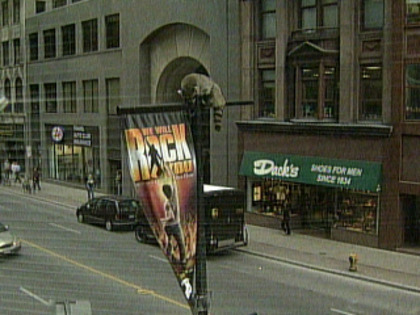 Pedestrians stopped to watch as an adult, male raccoon perched precariously on top of a lamp post at Adelaide and Yonge on Monday. As the wind picked up and the critter held on for dear life, a concerned crowd gathered. A woman from a nearby bank brought out some pillows in case it fell. Eventually, Joe Frost from AAA Wildlife Removal arrived, along with firefighters, to help it down. "Too many people around. Too much traffic. Yeah. He probably would have waited 'til tonight and then come down," says Frost. "But better safe than sorry." Toronto firefighters brought the aerial tower truck and a tarp. Frost went up on a sky jack while a group of firefighters waited below with the makeshift safety net. Frost was able to bring the raccoon down with no trouble. It's believed the raccoon was part of a family living in a nearby laneway. By law, wildlife officials have to relocate the critter within a kilometre from where they found him.